I'm not a big fan of frozen, processed, food (even if it's organic). But we all have emergency situations when we need a quick meal. As with other Amy's Kitchen's products, this one doesn't disappoint. It tastes really good. However, it has quite a bit of ginger. So if you don't like ginger, this is not for you. 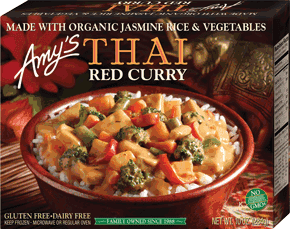 Additionally, this is one of the few frozen foods that look very similar to the picture on the box. So I'm glad to say it met my expectations.